Argentina : August 11 - 19 - wonderpaars jimdo page! We crossed the border by bus and ended up last night in the Argentine side of the world. Our first order of business was of course to sample the fine steaks and red wine that Argetina is known for and ended up with a feast fit for a king in front of us. Somehow we had no trouble indulging in all of it. The next morning we explored the falls and had the chance to feel as though we were admidst the forceful streams of water instead of just watching them. On this side, you can take a jet boat to the base of some of the falls or take the short hike on the wooden boardwalk to the Garganta del Diablo, Devil's Throat and stand feet away from the mighty waters. You can feel the sound and the force in all parts of your body. 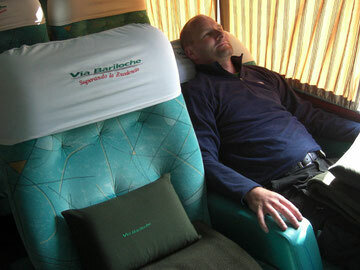 We experience our first Argentine bus last night and we can't wait to hop on the next one. We arrived at the bus station, uncertain what our 18 hour bus ride would really be like, but as we boarded and climbed the steps to the top level, we realized that we had just arrived at travellers heaven. The business class size seats, the blankets, the meals, the entertainment and the glass of champagne made this 18 hour bus ride to Buenos Aires not only enjoyable but convinced us that we needed to book as many bus rides in this country as we could! Unfortunately, we did not squeeze in another overnighter, but we're already planning our next visit! We arrived in BA and quickly met up with Guillerma, whom we had found on Craigslist of all places and would be renting an apartment from her for the week while we attended Spanish lessons. We met her at the apartment, signed some papers and there we were: renters of our first apartment in South America. Though small, it felt like ours.